Anyone who's walked a dog and seen it spring to attention when another dogs rounds a corner—even though that animal is still a full block away—may have wondered how exactly dogs recognize each other. What makes a golden retriever perk up its ears and wag its tail at an approaching greyhound but not, say, a stroller? Why does it ever occur to a dachshund to play with a pit bull in the park? Why don't average-sized dogs chase toy breeds away as if they were squirrels? 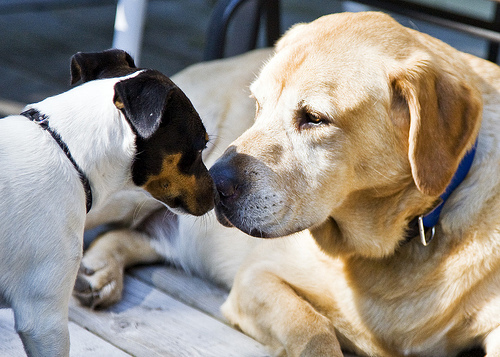 You might assume dogs, with their powerful noses, are getting an advantage from scent. Perhaps dog breeds all smell the same, despite looking wildly different. A new study, though, shows that dogs can find each other by sight alone. Dogs are able to spot another dog, no matter the breed, from among a crowd of other animals. Scientists don't know how they do it. Since other animals such as sheep, macaques, and cows have shown in the lab that they can recognize their peers by sight, scientists in France asked whether dogs could do this when challenged with a full complement of breeds. To understand the magnitude of the problem a dog faces, consider that there are 400 to 500 registered dog breeds. Dogs are more diverse than any other animal species on Earth. Furthermore, their vision isn't that great. If Fido wants to find a mate, though, he'd better know the difference between a Pomeranian and a fluffy cat. Bertrand Deputte of the National Veterinary School at Alfort, France, and his coauthors recruited nine dogs for their study. All the dogs were pets owned by veterinary students. They were a mix of male and female, and mostly mixed-breeds. In each stage of the experiment, a dog sat facing two screens on tables while a human stood behind it. (The human experimenter, to make absolutely sure he didn't give any hints, stood motionless and wore dark glasses.) On the experimenter's command, the dog walked forward and chose one of the two screens by placing its paw on a table. Choosing the correct picture got the dog a food reward. But what was "correct" shifted over the course of the experiment, as the researchers took the dogs through a series of challenges. In early sessions, dogs won a treat if they chose a screen showing a dog's face over an empty screen. They they had to choose a dog's face over a cow's face, where the dog and cow were the same every time but kept swapping screens. Then the dogs had to generalize: the screens showed dog and cow faces the subjects hadn't seen before, and they had to choose the dog. At last came the main challenge: dogs versus everything else. One screen showed a dog's face (a different dog every time) and the other showed some non-dog species (cow, cat, rabbit, human, bird, and so on). Every picture was zoomed in on the animal's head, so that the canine subjects couldn't get any clues from body size or shape—not to mention movement, sound, or smell. Some faces were shown straight on; others were in profile or three-quarters view. Nevertheless, every dog in the experiment succeeded. "We were rather surprised by the ease dogs had," Deputte says, "in spite of huge variability of dog breeds and the variety of animal and humans faces that constituted the other category." All nine dogs, once they'd learned what the human experimenter wanted, could consistently pick out the dog faces on the screens. To prove the dogs really knew their stuff, researchers also reversed the task and had dogs pick out the picture that wasn't a dog. They aced this test too. "We couldn't tell how the dogs succeeded" at grouping dog faces from various breeds and different angles all into one category, Deputte says. He believes his results show that dogs have a "concept of dog." Somehow, our pets know immediately whether the animal walking toward them is dog or not-dog. Along with knowing when to sniff the approaching animal's rear end, this may be a power we hopeless humans will never understand. UPDATE: Bertrand Deputte has clarified that his coauthor Dominique Autier-Dérian did the experimental work for this study. Nice, but confounded by memory.. To be sure, you'd have to use dogs that have not been exposed to the full range of dog shapes in real life before. How do dogs recognise other dogs - because they're not blind?